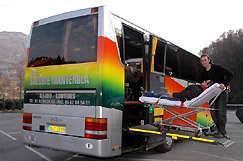 We are expanding our range of transport services for the sick and disabled. 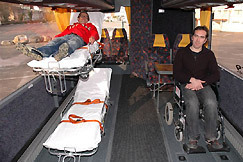 As of April 2000, we will be offering a coach which has been specially adapted for carrying stretcher- and wheelchair-bound disabled persons. Naturally, the coach is equipped with toilets and a galley . Tourist travel in FRANCE and OVERSEAS. School trips: Sporting events, school outings, senior citizens, work committees, ski schools, etc. Excursions to the areas surrounding Lourdes, the Pyrenees and Atlantic coast. TRANSFER between the SNCF train station / Airports and hotels in Lourdes. DELUXE COACHES: WC, video, bar, air conditioning, 25 to 56 seats. EXPERIENCED DRIVERS: who speak English and Italian and have an in-depth knowledge of the region. Sick persons' luggage ferried from the SNCF train station and the airport to the Lourdes in-coming agencies. Luggage belonging to stretcher bearers and young people staying in the various hotels and hostels in Lourdes. We operate vehicles from 3 to 7 tonnes, equipped with hydraulic tailgate. We will be happy to discuss your requirements and provide you with a quotation .